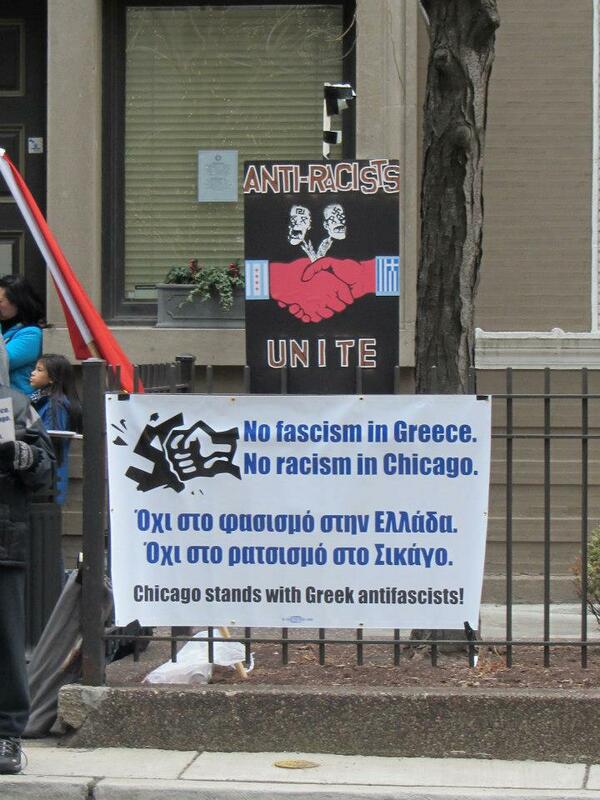 In response to the call for International solidarity against fascism by Athens antifa, dozens of anti-racists gathered outside of the Greek Consulate in Chicago to show solidarity with those in struggle against Golden Dawn in Greece and to network with folks opposed to the idea of Golden Dawns potential presence in Chicago. People chanted, held signs, handed out literature, and some gave speeches about fascism/antifascism and things relevant to it. Although the recent release by antifa that successfully identified Emmanouil Lallas and Joseph P Jordan as the number 1 and 2 players in New York Golden Dawn was done by an infiltrator pretending to be a supporter from Chicago, Golden Dawn claims to have actual contacts on the ground here. Whether this is true or not (lets not forget that the fascists love to lie and exaggerate), we are going to play it safe and take the fascists at their word. All in all the event was good in that some necessary networking was done and that there seemed to be a sense of excitement towards the work that may lie ahead. However, just like any other fascist groupings we have dealt with, it is going to take a lot more than symbolic demonstrations and showings of solidarity to stop Golden Dawn, regardless of where they set up shop. Intelligence gathering and consistent confrontation is key. We must identify their supporters, their members, their source of income, their spaces and their leadership and attack in every way possible if we want to drive them into inactivity. We have dealt with the fascists several times in our city and Golden Dawn, much like the scum who have came before them, will not be victorious! This entry was posted in Golden Dawn. Bookmark the permalink.